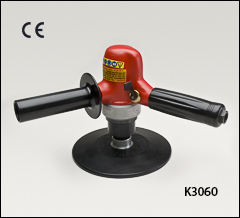 Right angle polisher, vertical polisher. The 5/8"-11 spindles on these polishers can be used with the 5" and 7 1/2" pads on our Backing pads for wool buffs page. For wool and foam buffs, please see our Buffs for 3" and 5"pads or Buffs for 7½" pads pages. SAFETY WARNING: Make sure the RPM of the polisher you choose below, does not exceed (is less than) the maximum RPM of any accessories you use with that tool. Sioux Industrial powerful 1.00 HP lightweight, and cool running. A remote exhaust prevents oil on the work. Governor speed control to maintain speed under load and save air at light loads. Lockoff lever, thumb throttle, spindle lock. 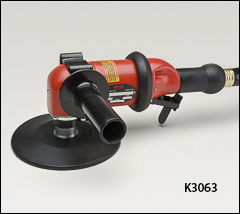 Polisher includes one 8" backing pad, pad nut, and wool polishing pad. 5/8"-11 spindle, 33 CFM @ 90 PSI, 1/4" air inlet, 3/8" min hose, 11" long, 75 dB(A). Sioux Industrial powerful 1.00 HP high torque motor for your most demanding jobs. Choose a thumb or lever throttle, with side exhaust and comfort grip handle. Both come with 8" backing pad, polishing pad, and spindle wrenches. 5/8"-11 spindle, 30 CFM @ 90 PSI, 1/4" air inlet, 3/8" min hose, 7" high, 80 dB(A).